In 2012 to coincide with Olympic Year, Ilkeston Tennis Club embarked on an ambitious community project to bring outdoor tennis back to Ilkeston. 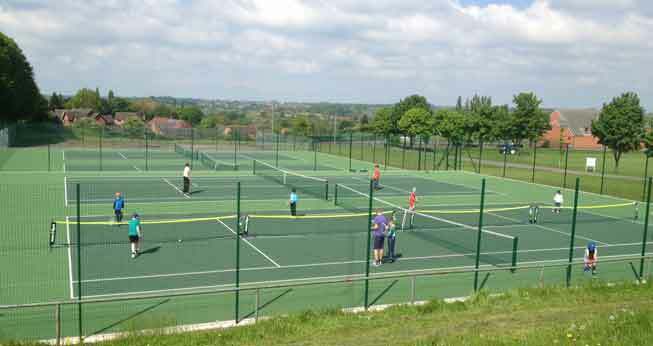 Having secured approval from Erewash Borough Council for a 21 year lease on 4 derelict outdoor tennis courts located at Rutland Sports Park, we refurbished the facility which included resurfacing, extending the courts slightly, and replacement of fencing. In doing so we managed to keep Ilkeston Tennis Club in the town of Ilkeston, provide affordable outdoor tennis facilities to the general public (the lease agreement provides for some public access), and will allow us to further develop our extensive programme of coaching for children / juniors in the local area. Join today and enjoy our 4 x new outdoor tarmacadam courts.